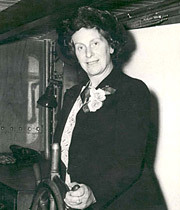 Dame Caroline Haslett made an enduring contribution to the status of women in the engineering and scientific professions, and in the electrical industry in particular. For many professional women in the early years of that industry and in engineering generally, she was "a spur and an inspiration". She achieved this through her development of the Electrical Association for Women, of which she was founding director, and through her tireless work on innumerable committees at all levels, many of which were devoted to the enhancement of womans' roles in business and professional life. To Haslett it was essential that women should take their full part in the development of the electrical industry, both for their own benefit and for the industry's benefit. To that end she championed the practical application of electricity in the home. She used her skills as a writer, editor, speaker, organizer and educationalist to encourage women to learn about electricty and its applications, and she was recognized for her efforts at the highest levels. Her charismatic personality, boundless energy and vitality, together with her loyalty to the organizations she served and her many colleagues and friends, enhanced her contribution. Those who worked with her regarded her with warm affection. Lord Citrine, Chairman of the Central Electricity Authority spoke of her "affability and sense of humour, her consideration for others and her regard for the people as well as the object of the committee or organization endeared her to a very wide circle of friends".